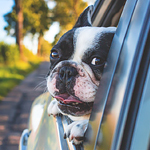 Is your vehicle dog-friendly? Certain vehicles are more dog-friendly than others. You can add features to your vehicle to make it friendlier for pets too. At MINI of Charleston, we love to see dogs in a safe and secure space when they travel. Consider the climate in your vehicle for maximum pet comfort. Dogs need more air to control how hot they are. A vehicle with vents in the back can help control the amount of heat they feel in the summer. A sunshade can also keep the heat from hitting them directly. Floor mats that you can spray off and seat covers you can wash are great accessories that will make things easier for you! Wider car doors, sliding doors, and lower liftgates are great for big dogs. If you don't have these, try a ramp to get them in and out of the vehicle easier! To keep your dog secure, consider a pet barrier or gate for your hatchback.